I gave up on finding an authentic, reasonably priced king cake in Huntsville this year. The king cakes at Publix have gone downhill since the days in which the bakery reportedly imported simple, unbaked cakes from Louisiana, baking and decorating them in the days leading up to Mardi Gras. This year, the offerings were filled with cream cheese in various artificial flavors, and I’m tired of bakeries trying to complicate the king cake. It’s SUPPOSED to be relatively simple. By the time you combine a thick, sweet filling with powdered sugar icing AND a heap of colored sugar on top, you’ve got a sickly sweet concoction that in no way resembles a traditional king cake. Even Earth Fare got in on the act, promising me a king cake complete with apple filling. After last year’s debacle with frozen bread dough, I decided to simply dedicate an afternoon to the old Southern Living recipe that my mom found some 20 years ago. 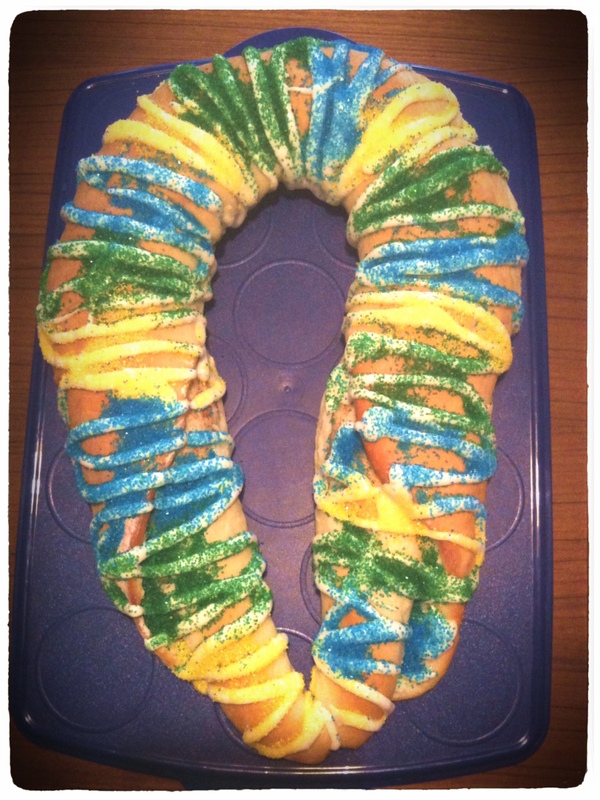 It had been too long since the husband and I had enjoyed the real thing, and I had volunteered to make a king cake for my co-workers in lieu of suffering through some sort of monstrosity filled with artificially flavored goop. I’m never convinced that I haven’t added too much flour in my efforts to make the dough manageable. My biggest complaint about this recipe is that it calls for flour by volume rather than weight; measuring flour using the scale is much more accurate than using measuring cups. The cake turned out fine, however, with both the husband and the co-workers giving it rave reviews. I’d still give somebody $20 to make an acceptable king cake for me, but apparently I’m not going to be able to do that in Huntsville anytime soon. Cook the first four ingredients in a saucepan over low heat, stirring often, until the butter melts. Cool the mixture to between 100 and 110 degrees. Dissolve the yeast and 1 tablespoon sugar in ½ cup warm water in a large bowl; let stand 5 minutes. Add the butter mixture, eggs and 2 cups flour; beat at medium speed with an electric mixer for 2 minutes or until smooth. Gradually stir in enough remaining flour to make a soft dough. Turn dough onto a lightly floured surface; knead until smooth and elastic, about 10 minutes. Place in a well-greased bowl, turning to grease the top. Cover and let rise in a warm place (85 degrees), free from drafts for 1 hour or until doubled in bulk. Stir together ½ cup sugar and cinnamon; set aside. Punch dough down; divide in half. Turn one portion out onto a lightly floured surface; roll to a 28-x-10-inch rectangle. Spread half each of the cinnamon mixture and the softened butter on the dough. Roll the dough, jellyroll fashion, starting at the long side. Place the dough roll, seam side down, on a lightly greased baking sheet. Bring the ends together to form an oval ring, moistening and pinching the edges together to seal. Repeat with remaining dough, cinnamon mixture and butter. Bake at 375 degrees for 15 minutes or until golden. Decorate with bands of frosting, and sprinkle with colored sugars. Note: This year, I spooned the frosting into a zip-top bag, cut off a corner and squeezed the frosting onto the cake. This gave me a much neater, more even application than I would have gotten by simply drizzling it on the cake. Also, sprinkling the sugar on top will make a HUGE mess. You’re going to want to sprinkle the sugar on the king cake far away from the edge of the countertop or table so you don’t get sugar on the floor. Moisten a couple of dish towels with water and place them on the surface beneath the cake platter (cookie sheet, whatever) that’ll be holding the cake as you sprinkle on the sugar. Stir together powdered sugar and melted butter. Add milk to reach desired consistency for drizzling; stir in vanilla. Note: The original recipe advises you to divide the frosting and tint it green, yellow and purple, but since you’re going to coat it with colored sugar anyway, you’ll do just as well to leave it white. Place ½ cup sugar and green food coloring in a jar or zip-top plastic bag; seal. Shake vigorously to evenly mix color with sugar. Repeat procedure with ½ cup sugar and yellow food coloring. For purple, combine red and blue food coloring before adding to remaining ½ cup sugar. Note: A couple of years ago, I discovered that Wal-Mart made much prettier, more vividly colored sugar than I could. My colored sugar was always paler than the sugar I saw in bakeries, and it was decidedly non-sparkly. You might have to use blue instead of purple, but you’ll live. I’ve never enjoyed king cake (King cake? King Cake?). What I mean is, I’ve never had it. It’s yet another southern delicacy I’ve yet to enjoy. Does it have a Twinkiesque taste? Or is it more like funnel cake? Or angel’s food cake? Or is it simply a very colorful cake? It’s most like cinnamon bread, but not the really sweet kind that we’re used to. It’s a basic brioche dough (it would mostly resemble French bread if baked without the cinnamon in the middle and the icing on top).